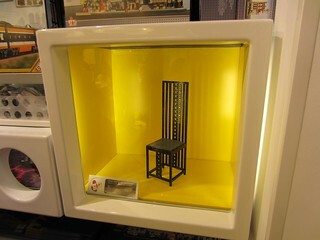 This is my representation of a chair designed by the Glaswegian architect and designer Charles Rennie Mackintosh (1868-1928). The chair was designed in 1904 for the Hill House in Helensburgh under the instruction of Walter Blackie. I built the chair for the Community Showcase window for the Glasgow LEGO brand store.